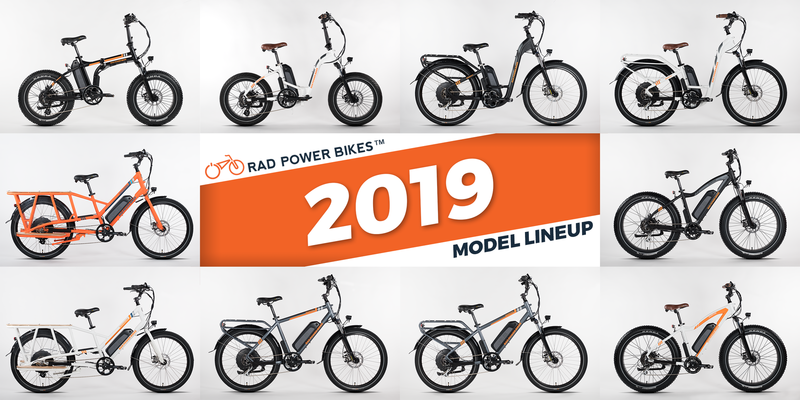 Rad Power Bikes’ Rad Rover and Rad Wagon impressed CleanTechnica’s Nicolas Zart and now the company is kicking things up a notch with a refresh of its lineup for 2019. The refresh is being led by the introduction of a new folding, step-through ebike called the RadMini Step-Thru that makes its RadMini an easier bike to ride with a step-through design and a more compact frame. Many of Rad’s other bikes are getting some love from the company based on feedback from customers, including the RadRover, RadWagon (which is just fun to say), RadMini, RadCity, and RadCity Step-Thru models. Funny enough, my family and I saw the RadMini when biking around the beach in our current town of Oxnard, California and it just made me smile. The bike is beautifully crafted with its folding frame and massive oversized tires that give the ride more stability on the street and the ability to actually ride reasonably well on the sandy beach. The new RadMini Step-Thru takes the build of the RadMini down a notch, with a more compact frame and a step through design that makes it easier to get on and off of, not to mention to move around. After all, the folding frame is intended to make the thing more portable. What’s great about a new lineup showing up in January is that the company has to clear out the 2018 bikes and is doing so in grand fashion. Head on over to Rad Power Bikes today to get all the juicy details about the new lineup and to see just how much the 2018 models are being marked down during the sales happening next week.